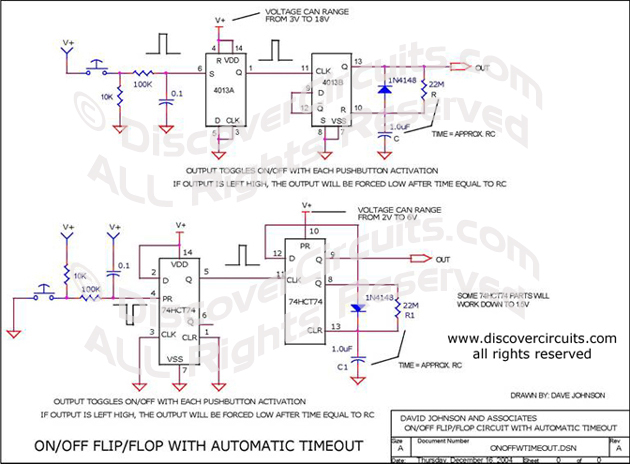 Circuit: On/Off Flip/flop Circuit with Automatic Timeout __ Circuit designed by David A. Johnson, P.E. This circuit is ideal when a device needs to be turned on and off with a single pushbutton switch, but also needs to turn itself off after some period of time. With the components shown, the output will stay on for only about 20 seconds.